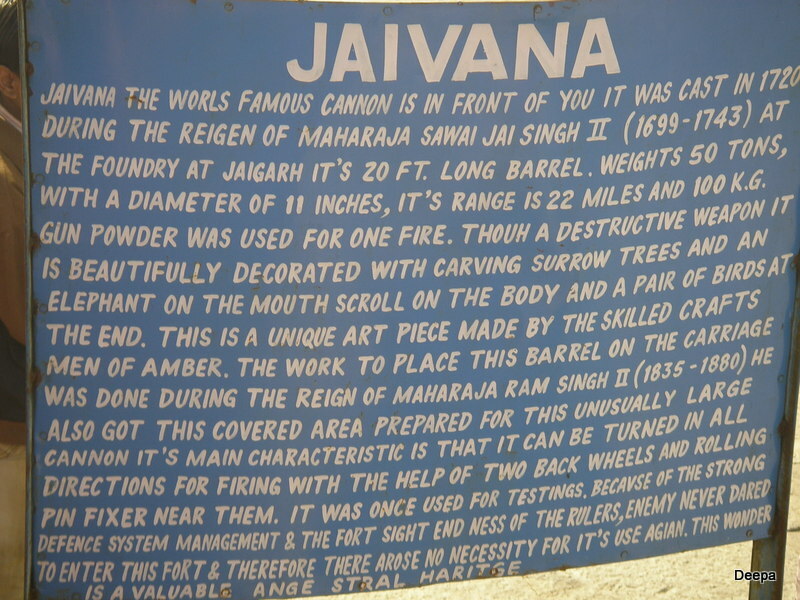 The Jaivana Cannon at the Jaigarh Fort, Jaipur is considered to be the largest wheeled cannon in the world. It weighs 50 tons and spans 6 m in length. It was cast in 1720 under the authority of Sawai Jai Singh, the administrator of the fort. The cannon is also a work of art, the barrel has a floral design. There are a pair of parrots carved in the centre and an elephant on the tip of the barrel and a pair of ducks at the rear. There are many stories surrounding the power and firing ability of the cannon. According to one, the cannon was fired just once, during testing and the impact was so great that it created a depression, where a pond is now present. Some other myths claim that it had a firing range of 40 km. While none of these stories have any documentation to support, it is undoubtedly a splendid peice of weaponry. We weren’t allowed to take pictures of the cannon, but here’s a signage with the description of it.